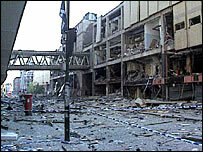 A review of the police investigation into the 1996 Manchester bombing has revealed that the IRA members behind it are unlikely to be brought to justice. Greater Manchester Police (GMP) Deputy Chief Constable Dave Whatton made the announcement in the run up to the 10th anniversary of the bombing on 15 June. He said that there was "no realistic possibility of a prosecution". GMP has released unseen footage of the 3,500kg device detonating at 2,500mph on Corporation Street. A white van is seen exploding as flames shoot into the air followed by a huge plume of smoke rising above the city. The images were taken from a police helicopter hovering above the crime scene. Homemade explosives were packed into the van which was parked close to Marks & Spencer on Saturday 15 June. 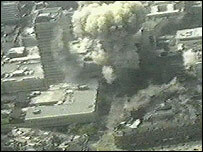 A coded warning was given, but the area was being evacuated when the bomb exploded, injuring 200 people and causing £700m worth of damage. Deputy Chief Constable Whatton added: "The Manchester bomb had a tremendous impact on the lives of people in the area, which is why we have thoroughly reviewed the case. "A team of officers from GMP's Anti-Terrorist Unit carried out a detailed analysis ahead of the 10th anniversary of the incident. "In consultation with the Crown Prosecution Service, we have concluded that at this time there is no realistic possibility of a prosecution. This has allowed us to release new material that we have held for the last ten years. "Any speculation about individuals alleged to be linked to the incident is unhelpful as there is insufficient evidence to substantiate charges. "As with all major investigations if new information comes to light it would be considered." The bomb damage to the city centre - including Marks & Spencer, the Arndale Centre and Exchange Square - led to a massive regeneration programme in Manchester.